Freddy (Mercury) would indeed be extremely proud of Roger Daltrey (who?). Daltrey is none other than the lead singer of one of the world’s all-time great rock bands of the 60s, 70s and also 80s: The Who. And why would Queen’s former lead singer be proud? Because Daltrey held true to Freddy’s words, “The show must go on”! 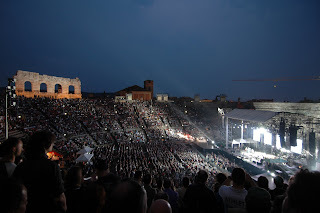 In Verona’s ancient Roman Arena your correspondent took in probably one of the most surreal concerts of his life (now at 152 concerts): The Who’s performance under a torrential rainfall (the first time for me). 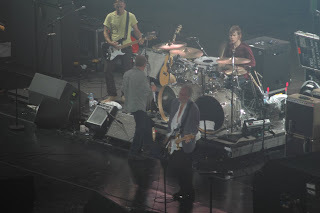 Surreal because poor Daltrey, supported by his long-time companion and formidable guitarist, Pete Townshend (the only two surviving members of that band, the other two being bass guitarist John Entwistle and that mad drummer Keith Moon), virtually had no voice left by the end of the concert. After only five songs into the concert and after a tremendous start, the concert was suspended for one hour as we were all hit by a violent thunderstorm and with some rather menacing thunderbolts. I was personally optimistic that the show would go on. And it did but with one hitch: Daltrey's voice, as he himself admitted it, had become "cold" because of the long pause and the humidity provoked by the downpour. His voice literally cracked on certain songs and he was seen to be extremely frustrated and even argued with Townshend as he wanted to literally throw in the towel. The great professionals that they are, they decided, once the roadies worked to clear the stage of all the water, to continue with the show. 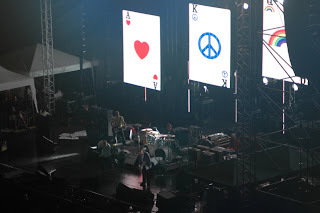 They started the concert with “Can’t Explain” and continued with some of their epic songs such as “My Generation”, “The Kids Are Alright”, “Baba O’Riley”, “Magic Bus” and “Pinball Wizard”, a song made famous also by Sir Elton John. 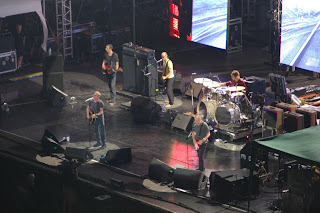 But the best was yet to come as everyone in the Arena anxiously waited for perhaps their most famous song, “Won’t Get Fooled Again", a song that was wanted by Michael Moore for his movie, "Fahrenheit 9/11" (but which was diplomatically refused by Townshend). Their fantastic performance of this song at the 1985 Live Aid concert at Wembley shows Daltrey reaching an incredible peak with his voice towards the end of the song. I personally thought, given the tragic condition of his vocal cords, that Daltrey would miss that peak. Instead, for the immense joy of all those present, Daltrey, no doubt totally exhausted, came through! No encores, no more songs as Townshend hugged his old chum as though to say, “We did it”! Indeed a moving moment for us all as I would say 99% of us truly appreciated Daltrey's incredible effort. And not doubt also Freddy approved from rock and roll heaven. On a final note, another treat unfolded before our eyes as on drums was none other Zak Starkey, Ringo Starr's son! This was the second time for me seeing Zak beating away on the drum skins as I had seen him a few years ago playing for Oasis. How ironic: it was Zak that once said that he didn't think that his father was a great drummer, but instead thought that Moon was much better! And here, almost 30 years after Moon's death, Zak ponded away at those drums in an impressive manner, a manner that also Moon would have appreciated. 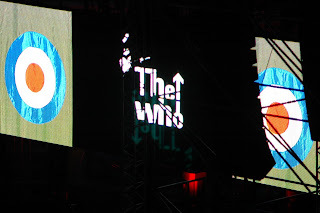 For me another special moment: it was 30 years ago that I saw the entire Who band perform in Canada, and 30 years ago I had been in the same Arena for another great band: Chicago. Quite the (wet) night (all pics by M. Rimati)! But will he beat people over the head? Oh Canada, how lucky you are!